Post Race at the Sawtelle Stampede. 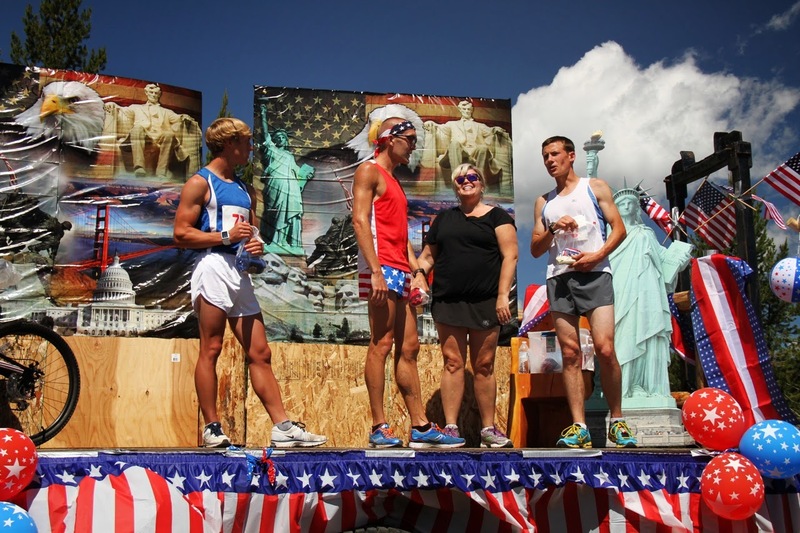 The race atmosphere oozed patriotism. 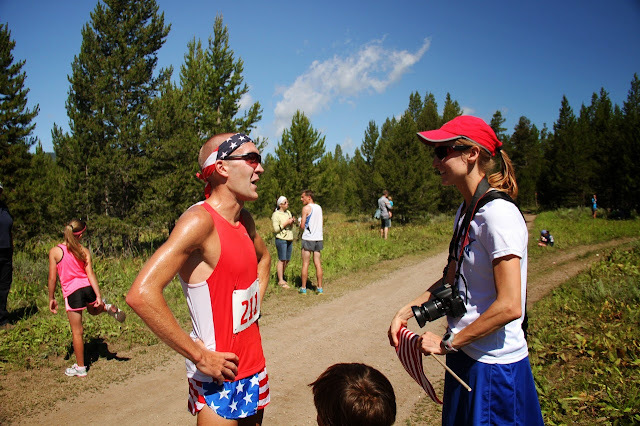 I ran two races over the holiday weekend - first up was the Murray 5K on July 4th (part of the USATF-Utah Racing Circuit) and then on July 6th I ran the Sawtelle Stampede (a high-elevation trail half-marathon in Island Park, Idaho). Someday I will run 5 kilometers at a pace faster than I do for the half marathon. Today was not that day! Teren won easily in 15:19, then Josh McCabe was just in front of me in second (15:42). Felt flat on my warmup and never got going. Teren and Josh were way up (~20 seconds) on me at the 2-mile mark, and Josh was coming back to me in the last quarter mile, but my kick was non-existent again. Splits - 5:03, 5:00, 5:11, 28. Gotta kick this sinus infection. It doesn't affect me too much on easy stuff, but I feel like it affects me a little more when I try to run fast. I know I said "no more half-marathons until TOU 1/2", but I'm making an exception for this... it was an ALL-AMERICAN FUN RUN for crying out loud! Our friend Fritz told us about this race a couple weeks ago... it's something of a tradition for his family, and apparently the race has grown from about 20 people to probably close to 400 this year (between the Kids' 1K, 5K, 10K, and HM). It was an awesome, low-key, fun community event. You could almost call this a trail race. The course was a rolling jeep road/trail at ~6500+ feet with plenty of hills. I was thinking that Fritz and I would run ~1:20 and easily take the top two spots... but there were some other very good runners there and it turned into quite a battle. Elijah Armstrong (a high-schooler who ran 14:28 for 5000m on the track a few weeks ago) stuck right on me until the very end, along with Jacob Howell (who only fell back a tiny bit over the last two miles). 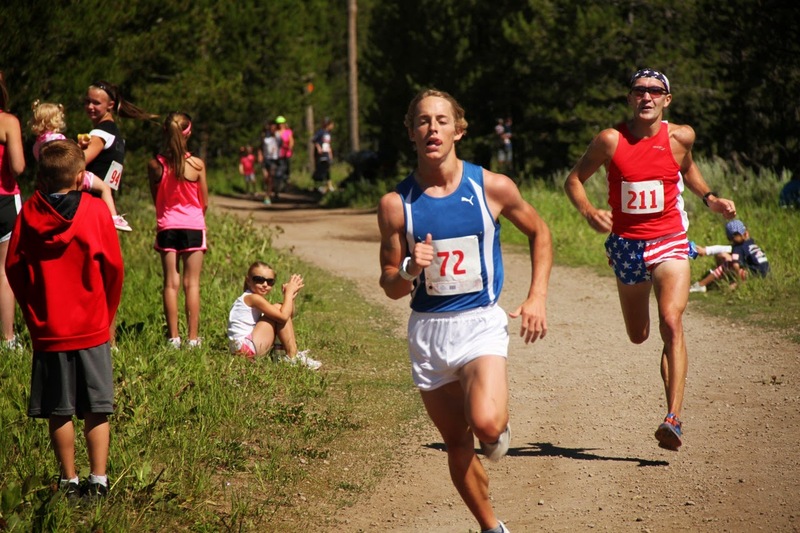 I had no idea who Elijah was at the time, but I suspected he was very fast because we were moving a really good clip for that altitude/terrain, and he was strong all the way. It came down to a kick, and I should have known better to wait until the last 75 meters because he got a jump on me and I wasn't able to match it... he won by a full second. He really impressed me... the kid is the real deal. I was pleased with the effort. It was a great aerobic tempo run type workout, and I came away with a nice chunk of gold coins. Mostly it was just a really fun day with Andrea, Amiee, Fritz, and his family. Fritz's nephew ran the Kid's 1K and the girls all ran the 5K. We had a great time. And Island Park is beautiful! My parents live near there and I find when I try to run up there (around 7000 ft where they live) I struggle so much. Breathing is overrated, though, right? Way to not let the altitude slow you down! Its a great altitude for training. You can go "easy" pace but still get a great stimulus. I love all the dirt roads up that way.